Friday February 2nd 1894 Will went to the valley to be gone all day. I worked all the forenoon making hominy. I got me a little dinner and dressed to go calling. Was at Dr Brush to invited them for supper on Tuesday night. went to see Mrs Rich but did not find her at home. When I got home found Lib Stevens here. I got supper over early read in the evening. We were tired and went to bed early. Saturday February 3rd 1894 I was all forenoon doing baking and sweeping Soon after dinner I took "Soukie" to have her picture taken. I then went down town. Will came to a five oclock supper and after that I went over home to spend the evening. He came for me and we took our bath after coming home. 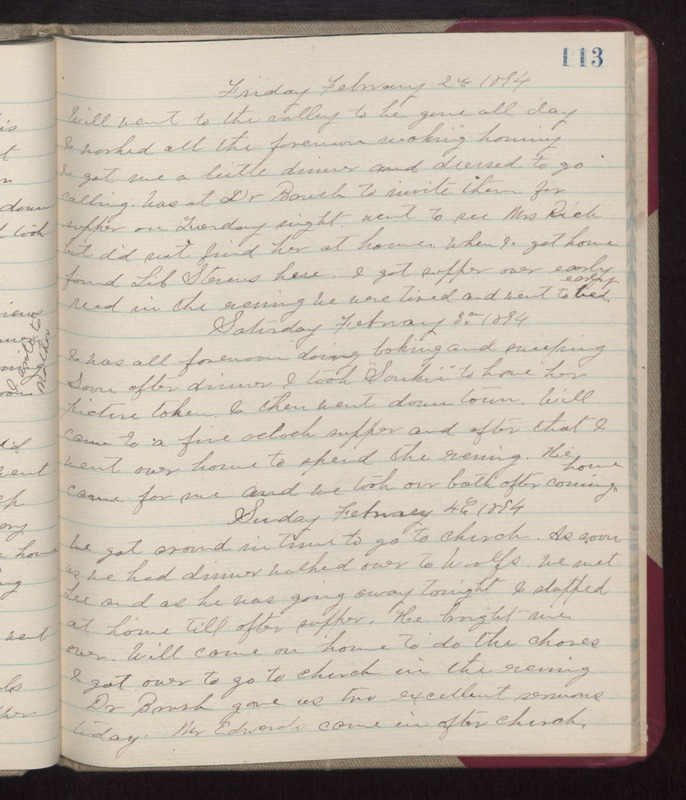 Sunday February 4th 1894 We got around in time to go to church. As soon as we had dinner walked over to Woolfs. We met Lee and as he was going away tonight I stopped at home till after supper. He brought me over. Will came on home to do the chores. I got over to go to church in the evening. Dr Brush gave us two excellent sermons today. Mr Edwards came in after church.